"Hitman" redirects here. For other uses, see Hitman (disambiguation). Contract killing is a form of murder in which one party hires another party (often called a hitman) to kill a target individual or group of people. It involves an illegal agreement between two or more parties in which one party agrees to kill the target in exchange for some form of payment, monetary or otherwise. Either party may be a person, group, or an organization. In the United States, the crime is punishable by 15 years to life in a state penitentiary. Contract killing has been associated with organized crime, government conspiracies, and vendettas. For example, in the United States, the gang Murder, Inc. committed hundreds of murders on behalf of the National Crime Syndicate during the 1930s and 1940s. Contract killing provides the hiring party with the advantage of not having to commit the actual killing, making it more difficult for law enforcement to connect said party with the murder. The likelihood that authorities will establish that party's guilt for the committed crime, especially due to lack of forensic evidence linked to the contracting party, makes the case more difficult to attribute to the hiring party. A study by the Australian Institute of Criminology of 162 attempted or actual contract murders in Australia between 1989 and 2002 indicated that the most common reason for murder-for-hire was insurance policies payouts. The study also found that the average payment for a "hit" was $15,000 with variation from $5,000 up to $30,000 and that the most commonly used weapons were firearms. Contract killings accounted for 2% of murders in Australia during that time period. Contract killings also make up a relatively similar percentage of all killings elsewhere. For example, they made up about 5% of all murders in Scotland from 1993 to 2002. Shiori Ino, a 21-year-old University student killed by hitman Yoshifumi Kubota, who served 18 years in prison for the killing. He was paid by her ex-boyfriend and his brother. Harry Greenberg, a Mafia associate of Charles "Lucky" Luciano, Meyer Lansky, and Siegel. He was killed by Siegel, Whitey Krakower, Albert Tannenbaum, and Frankie Carbo in 1939. Nicole Doucet Ryan attempted to hire an undercover Royal Canadian Mounted Police officer to kill her husband. After ruling that she could not use the defense of duress, the Supreme Court of Canada ordered she could not be retried. Tim Lambesis, former vocalist of heavy metal bands As I Lay Dying, Austrian Death Machine and Pyrithion, who attempted to hire someone to murder his wife through a contact at his gym. The alleged "hitman" turned out to be a police officer masquerading as a hitman. Silas Jayne, Chicago-area stable owner, was convicted in 1973 of hiring hitmen to murder his half-brother George. Mike Danton, former NHL player, hired an undercover federal agent to kill his sports agent. Italian crime boss John Gotti hired hitmen to murder Paul Castellano outside of Sparks Steak House; the murder was carried out in December 1985. Wanda Holloway: The Positively True Adventures of the Alleged Texas Cheerleader-Murdering Mom is based on Holloway's hiring a hitman to kill the mother of a girl competing with her daughter at cheerleading. Charlotte Karin Lindström, Swedish waitress/model who attempted to hire a hitman to kill persons testifying against her boyfriend in a drug trial in Australia. Pamela Smart of Derry, New Hampshire, who made national headlines in 1991 for hiring teenage lover Billy Flynn and his friends to murder her husband Gregory Smart. Wallace Souza, Brazilian television presenter who was accused of hiring hitmen to murder at least five people in 2009 to increase his programme's ratings. Ruthann Aron, convicted of hiring a hitman to kill her husband and a lawyer who had won a fraud case against her. Charles "Lucky" Luciano, American Mafia and Luciano crime family boss. 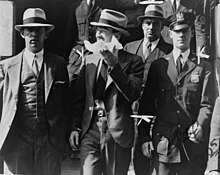 Ordered Siegel, Tannenbaum, Genovese, Buchalter, Carbo, and Krakower to murder Mustache Petes Joe Masseria and Sal Maranzano in 1931, and stool pigeon Harry Greenberg in 1939. The Commission, American Mafia ruling body that ordered Siegel's murder in 1947. Jennifer Pan, Canadian woman who hired three men to stage a home invasion in order to eliminate her parents in 2010. Thomas Bartlett Whitaker, American man who hired people to attack his parents and brother in a home invasion in 2003. Fictional cases of contract killing or "hitmen" are depicted in a range of popular fiction genres in the 20th and 21st century, including films, comic books and video games, one most notably being the video game series Hitman, where the player controls a hired hitman simply known as Agent 47. ^ "Lovers top contract killing hit list". CNN. February 5, 2004. ^ "Homicide in Scotland, 2002". Government of Scotland. ^ "Ex-husband in hit-man case says courts were wrong - Nova Scotia". CBC News. ^ "Tim Lambesis Sentenced to Six Years in Jail for Murder-for-Hire Plot". Retrieved February 21, 2016. ^ Boyle, Robert H. (June 4, 1973). "End Of A Bloody Bad Show". Sports Illustrated. Retrieved March 21, 2013. ^ "Mob Boss John Gotti Is Dead". The Smoking Gun. June 10, 2002. Retrieved May 10, 2015. Nothing Personal, a television documentary series that focuses on stories of contract killings. Wikimedia Commons has media related to Targeted killing.